This is a visually stunning display of concepts, characters and starships from a galaxy far, far away that, more often than not, didn’t even end up on screen. Do you remember that part in Star Wars: The Force Awakens when we encountered the ghost of Hayden Christensen’s Anakin Skywalker, torn between the light and dark side of the Force? Torn between being Anakin and being Darth Vader? But it almost happened. Or, more accurately, it was at least considered enough of a possibility by filmmakers during the movie’s pre-production phase for concept artist Iain McCaig to create several mock-ups of the left side of Christensen’s face merged with Vader’s recognizable mask. 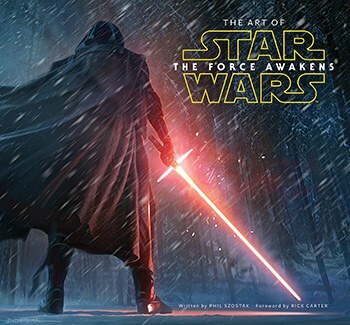 This is the kind of material you’ll find in the fascinating new hardback, The Art of Star Wars: The Force Awakens. If seeing this sort of groundbreaking concept art sounds like the Force is with you, then this collection is indeed for you. If not, that doesn’t make you a scruffy-looking Nerf herder; it just means this isn’t the book you’re looking for. To coincide with the film’s December theatrical release, the heavy 256-page book gives fanboys and fangirls a detailed inside look at the evolution of the visual appeal of this record-breaking film by putting an abundance of production paintings, concept sketches, storyboards and blueprints on display. In the book, not only do you see the designs for now-familiar things like Rey’s speeder and Luke Skywalker’s latest robes, which appear almost exactly like they do in the film, you’ll also witness the revealing of numerous concepts, beings and designs that failed to end up on screen. After all, no matter how many characters, starships, or fantastical creatures you enjoyed in The Force Awakens’ 135 minutes, it’s not surprising that there were countless more that didn’t make the final cut. Presented in chronological order, from January of 2013 to January of 2015, the book takes readers through the journey of making J.J. Abram’s film, tracking the progress from the earliest gathering of artists at Lucasfilm to the movie’s production at Pinewood Studios to the stellar postproduction process at Industrial Light & Magic. The book, credited to The Force Awakens’ conceptual researcher and archivist Phil Szostak, features brief interviews with a variety of members of the entire creative team, including Lucasfilm president Kathleen Kennedy and production designers Rick Carter and Darren Gilford. Szostak, understandably, provides most of the context as he introduces and analyzes each section of work, which is organized chronologically, typically by month. However, many artists whose work is included briefly explain the thought process behind their substantial pieces of art. The Art of Star Wars: The Force Awakens is most engaging when it offers glimpses of roads not traveled in a galaxy far, far away. 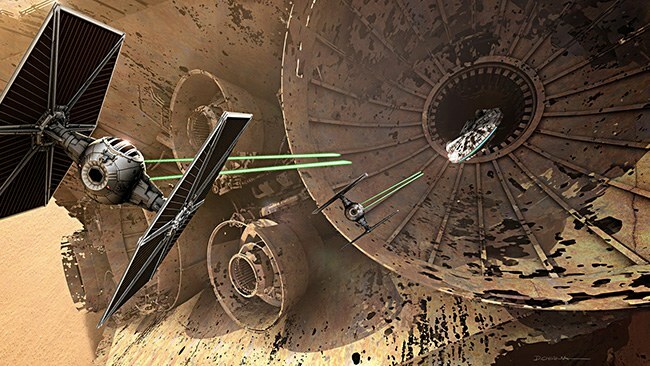 The most interesting inclusions are from the “guided imagery” concept phase, which features designs that came before any finished script or treatment, where new and seasoned creative wizards at Lucasfilm were tasked with painting new Sith lords, sketching space freighters and sculpting alien creatures. Yoda might have said, “Do or do not. There is no try,” but this book is full of “try”. As a result, there’s a lot to see. Critics upset that only X-wings were represented in the film might be pleased to see designs for L-wings and K-wing starfighters. Fans of the Darth Maul character will see his influence as concept artists painted red, tattooed villainous creatures to be considered for the then yet-to-be written “Jedi Killer” character. Meanwhile, fans of whimsy, J.J. Abrams, droids, and/or office supplies will be pleased to find that the director’s rough sketch of the droid BB-8 on a Post-It note is essentially as true-to-screen as any intricate, painstakingly formed design you’ll find in the book. Along the way, there are curious details about the plot during its infancy including the notes that Daisy Ridley’s Rey was originally named Kira and that Finn, John Boyega’s defiant Stormtrooper, was originally conceived by filmmakers as charismatic white man named Sam. Furthermore, the most die-hard collectors of Star Wars memorabilia may notice that while characters like Constable Zuvio and Sarco Plank didn’t appear in the film, they got their own action figures, perhaps in part thanks to their inclusion in this compilation of strong concepts for striking characters. It should also be stated that the last pages of the book contain quite the tease for the saga’s upcoming films. It’s vague enough to not be considered a true spoiler, yet certainly hints at some big twists and reveals to come when this new Star Wars trilogy concludes. Overall, for generations of fans who dreamed of getting a new Star Warsfilm, The Art of Star Wars: The Force Awakens is a window into how the much celebrated new chapter in the Star Wars saga was dreamed into being by a group of talented people from a galaxy not so far, far away.